← What will the inauguration of President Trump bring to Africa? In February last year President Mugabe announced that the eight mining companies operating in the Marange diamond fields in the east of the country would be nationalised, claiming that the companies had ‘robbed’ the country of its mineral wealth. Since 2006 when the surface alluvial diamonds were ‘discovered’ in Marange, the massive wealth generated by these small stones has caused havoc. The experience of Marange over the past decade is an important lens on Zimbabwe’s tortured politics and economy in this period. An excellent book has just been published by the wonderful Weaver Press in Harare – Facets of Power: Politics, Profits and People in the Making of Zimbabwe’s Blood Diamonds. Edited by Richard Saunders and Tinashe Nyamunda it offers a series of chapters covering the Marange story from different angles. The basic storyline of corruption, patronage, violence and theft is well known, with parallels in other mining sectors as discussed previously on this blog. No-one knows how much of the diamond wealth was siphoned off and never declared. When Tendai Biti was Finance Minister in the ill-fated Government of National Unity (GNU) he was in constant battle with the Ministry of Mines, attempting to get transparent declarations. No-one knew the scale of corruption and theft, but it was clearly massive. President Mugabe himself claimed that only $2bn of a potential $13bn of mining revenue was ever declared. In the introductory chapter, Richard Saunders describes the ‘perfect storm’ that was the Marange story: “The confluence of extraordinary conditions – a once in a lifetime diamond strike; a state characterised by military partisan control, elite predation and withered professional capacity; and the presence in willing partners in a shadowy international trade – cast Marange’s diamond fields into the centre of politically inflected, violent and ultimately destructive struggle for control over extractive resources”. But there are important nuances to this standard narrative repeated in the introductory chapters that are revealed by other chapters in the book. These make any simplistic, sweeping perspective on Zimbabwe’s ‘blood diamonds’ more complex. As various contributions to the book show, although gaining the epithet from international campaign groups, Zimbabwe’s diamonds were not the classic ‘blood’ or ‘conflict’ diamonds of, say, Angola or Sierra Leone, directly feeding armed militias and insurgents. Instead Zimbabwe’s diamonds fuelled different forms of patronage and corruption, sometimes for sure linked to violence, but with multiple beneficiaries who shifted over time. In this sense Marange became the symbol of a classic ‘resource curse’, undermining accountability and fuelled by a corrupt legal and political order, linking political struggles with accumulation and elite formation, as Alois Mlambo describes in the Foreword. But this was not just a Zimbabwe phenomenon, as is sometimes suggested. The international connections, feeding local corruption, were important. The chapter by Alan Martin offers a detailed and fascinating account of the murky international networks associated with the diamond trade over time. The connections with Dubai, India, Belgium, South Africa, the UK, US, Israel and more were crucial. Competition in the international diamond trade – from traders to distributors to processors to retailers – had big effects on who became involved at the Zimbabwe end, and what deals were struck with both companies and state officials. Of course the evidence is inevitably patchy and secretive, as much of this activity was illegal, but the chapter sheds important light on the international dimensions of the story, including the clear limitations of the Kimberley Process, the global certification attempt established in 2003 to ensure accountability and transparency in the diamond trade, and the focus for much local and international civil society action. As the book shows, there were clearly different phases of exploitation of the Marange diamond fields over the last decade, involving different actors, with different political connections, and with different patronage networks. The first phase involved African Consolidated Resources, a company with British connections, who had the mining rights to the newly discovered field. However their license was quickly withdrawn. Here the rhetoric of indigenisation and resources for the people was used, although the party-state at that stage showed little interest at the highest levels, not knowing the extent of the find. 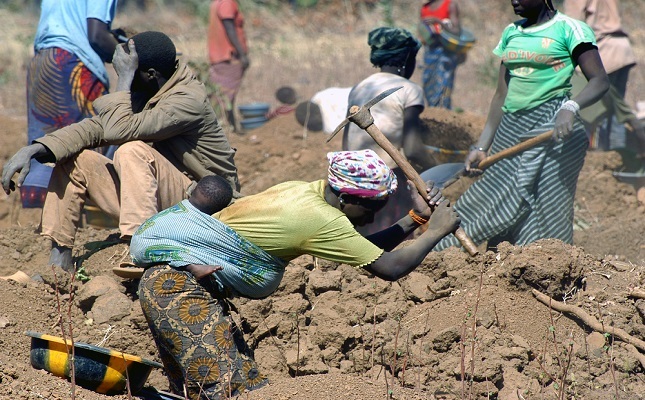 From mid-2006 followed a period of ‘free-for-all’ when informal miners arrived en masse. This was a period when the economy was in crisis, inflation was accelerating, and when many were looking for alternative sources of income. People had been displaced by Operation Murabatsvina in 2005, and younger people often had not benefited from the land reform in 2000. At its peak in 2007-08 there were reputedly 35,000 people – miners, traders, service providers of various sorts – living in and around the Chiadzwa area. The excellent chapter by Tinashe Nyamunda provides an important insight into this period, showing how mining was organised, and how miners had to link with policy and security syndicates, paying off other officials in turn, in order to operate. Links to traders were facilitated and cuts were taken at every stage. As the chapter shows, this phase resulted in major gains for many, both in the area and more broadly. The rapid accumulation of wealth – notably cars and trucks, but also a range of consumer goods – was tangible, resulting in a boom at a time when the national economy was nosediving. I remember being in Masvingo at this time, and young men (and some women) were coming back with a range of smart clothes, music systems, and more. This all changed in late 2008, when the state announced the privatisation of the diamond fields, expelling the informal miners overnight in a ferocious, violent clampdown. The stories I heard back then were terrifying and the chapters in this book relay them again. About 200 people are reported to have been killed as security forces enforced the ban, making way for a series of state-sanctioned investments, where the government held a 50 percent stake. A number of these companies became major operators, bringing in huge equipment and massive workforces, including the infamous Chinese company, Anjin, with its close connections to the Zimbabwe armed forces. In this phase, as Nyamunda shows, the patronage networks shifted. It was no longer the local officials, police and security personnel who were involved, but this now all moved to a much larger scale. This was the period, during the GNU, when ZANU-PF were re-establishing their base, and diamond money was an important source, and when what some have called a parallel or shadow government was in place. It was also a period when some senior party and military/security officials gained huge wealth. The book mentions the then minister of mines gloating that he was the richest cattle owner in the country. Certainly across Matabeleland the building boom associated with his tenure in office is legendary. Ironically, from 2009 was the period when Zimbabwe re-entered the Kimberley Process, and Zimbabwe’s diamond trade became legal. Certification requires formal mining by companies, and not informal systems, and the privatisation with government oversight ensured compliance. This period is when theft became legal. In 2013 a brave parliamentary portfolio review exposed some of the extent of the looting that had gone on following an in-depth, although obstructed, investigation. The cries of Tendai Biti were reinforced. But still these went unheeded, and the diversion of funds on a massive scale continued. We do not know why the president decided suddenly nationalise the diamond industry in 2016 and put it all under a single body. Many are crying foul with court cases challenging the decision. The official rationale was that this was to stamp out corruption, and ensure revenues flow to the finance ministry. Of course the on-going attempts to woo the international community by Finance Minister Patrick Chinamasa under the banner of economic reform must have played a part. The IMF inspection missions were certainly on his case with respect to minerals revenues. But the suspicion must also be, as hinted in the epilogue to the book, that this also reflected shifts in power and patronage, ones that required new people to benefit, as those who profited from 2009 lost favour. As is the case too often with mineral wealth in Africa – whether oil in Nigeria or diamonds in Sierra Leone – massive natural resource wealth can result in chaos if not well managed. Accountable, transparent systems of resource governance are rarely in place, and greed, corruption, and shadow authority takes precedence. Once thought to last for 20 years or more, Zimbabwe’s diamond fields are producing less and less. The extractivist boom has lined the pockets of some – initially more widely and then narrowing to a well-connected state-party-military elite, and their international connections – but the wider wealth such a resource could have offered to the nation, as glimpsed at in the early informal phase, has since tragically been squandered.